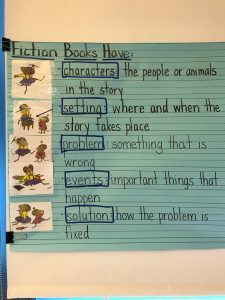 First Graders concluded the fiction elements reading unit. We learned to use story elements such as characters, setting, a problem, other important events and a solution in our retells. In the latter part of the month, we began to take a close look at non-fiction books. We compared fiction and non-fiction texts and sorted books based on the fiction and non-fiction elements that we found. This month we will continue to explore non-fiction texts. We will identify non-fiction features and the purpose of each feature. We will practice using text features to locate important information in our books. We will study different texts on the same topic and notice how the information presented is the same and different. You can support your child as they read non-fiction at home by discussing features, facts, and wonderings as they read. First graders used what they learned during our fiction reading unit to plan and write fiction stories. 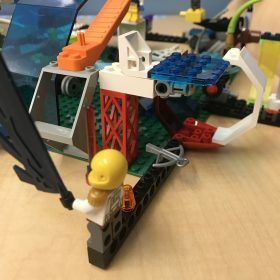 Children learned to choose or create a character and setting and plan a series of connected events that could include a problem/solution. Some kids elaborated by adding dialogue, thinking, and feelings. They revised and edited their work multiple times to ensure that the stories were their best work. Next, we are starting nonfiction writing in connection with our seed study unit. Students have already begun using elements of nonfiction in their seed study journals and on field trips. Kids drew realistic pictures of the many different leaves they saw in the Brooklyn Botanic Garden. They used labels to name the parts of the picture. Children used realistic colors in their drawings. They observed closely, and sometimes drew zoomed in visuals of the objects being observed. Finally, children wrote sentences about each picture to describe what they saw. Next, we will delve deeper into using the features of nonfiction text to express and teach information. Our following unit will focus on nonfiction writing. Children will write how-to books based on our seed study unit. First graders completed a unit on doubling. We studied partners and pairs and played many doubles games to help us learn our doubles facts. This month kids worked on problem solving steps and strategies. We learned to listen/read the problem and imagine the situation in the story. Some questions we thought about are: What information does the problem give? What problem needs to be solved? Students then showed their thinking on paper by using number sentences, organizing their work in a neat way, labeling, drawing pictures or symbols, and sometimes using words to describe the work. We will continue to work on problem solving during the next two weeks. We will begin to solve comparison and missing part problems and explore efficient ways to solve problems with 3 or more addends. We are sending home a game called Make 10 Bingo to practice tens facts. The directions are attached to the game board. You can use the decks of number cards sent home at the beginning of the year, or use a regular deck of cards with just numbers 1-10 (add a card for zero). Knowing tens facts “in a snap” will benefit children as they expand their mental math abilities. For example, kids may begin to solve 8 + 5 by making a ten (8 + 2) + 3. In Seed Study, students read, planted,observed, sketched, and wrote about seeds. We dissected fruits and extracted seeds. We attempted to sprout all of the seeds and planted and graphed seed growth. Family Thursday was a highlight for our class. Kids were very excited to plant and most of our bean seeds have sprouted! During the past week, we have had several opportunities to observe, sketch and write about our plants as they grow and change. We’ve labeled parts of our plants, including the stem, shoot and leaves. Next, we will dissect seeds and learn their parts. We will also conduct some experiments to explore how seeds travel in wind and water. Next week, we will visit the Union Square Greenmarket and learn how seeds are used as a food source. We will need several families to volunteer to take our plants home and water them over the break. Please let us know if you’re interested in helping out. We’ve begun posting pictures of kids at work and what we are learning. Please check Seesaw! December 24th- January 2nd- Winter Break! First Graders are concluding a unit of study for the elements of fiction. Children learned that fiction stories are spun from our imagination and can contain things that wouldn’t happen in real life. Kids learned that most fiction stories have common elements or features including: title, setting, characters, events, a problem, and/or a solution. Not all stories have all elements. For example, some stories may not have a problem. Understanding the elements of fiction helps kids comprehend and talk about books, including being able to retell a story to a friend. Next we will learn about the features of nonfiction text and how we can use those features to understand our books. First graders were very excited to complete their first writing cycle of the year! We started by thinking about what was important in each first grader’s life. Students created writing hearts and picture collages which then became fodder for imaginative stories or realistic nonfiction books. Children wrote over several pages to expand their books, and they used the five senses to add details to their writing. Kids looked back at the books they created and began the publishing process. Kids reread their books and changed whatever didn’t make sense, they used the Word Wall to fix spelling, they added punctuation, they created covers and titles for their books, and finally, they practiced reading aloud to prepare for presenting their books to others. Next, we will use everything we learned about the elements of fiction to write our own fiction stories with vivid characters and interesting events. One thing that helps story writing…is story talking. Next time you see an interesting picture, you may try asking your child what they think is going on in the scene. First graders are finishing a unit of study about doubles and pairs. We started by asking students to think about how our class walks in two lines and whether everyone has a line partner in our class of 29 kids. We then asked, what if the class had only 3 people, 4 people etc. Students explored numbers between 1-30. Then we moved into doubling: we asked kids to think about real life things that usually come in pairs: shoes, gloves, etc. Kids realized that if each person in a group has 2 of something, then the total number of objects can be found by doubling the number of people. Students used doubles facts (1+1, 2+2, 3+3…) and skip counting by 2’s (2, 4, 6, 8…) to problem solve. They recorded their problem-solving process through pictures, numbers, number sentences, labels, and words. Next, we are moving into a problem-solving unit. Children thought about events in school or in their lives that trigger intense emotions. We read a book about a child who goes to a special calming place when they are feeling very upset. The children then chose a space in the classroom where they could go when they felt upset. We generated some calming activities to choose from and made those materials ready in that area. We named it the Peace Corner. In Seed Study, students are beginning to learn about seeds. We began by thinking about what we already know about seeds and where we find them. We listed seeds that we know and looked carefully at pictures of those seeds. We learned that we can use specific words to describe seeds and noticed that seeds come in a variety of shapes, colors, sizes, and textures. Following that, we each explored, discussed and wrote about a variety of seeds that we have in our classroom. Next we will collect foods that may have seeds in them. Please send in an item that contains a seed(s) by Monday, November 5th. We will make predictions about whether we will find seeds in a food, then we will dissect foods to find out. Children are learning to be scientific about studying seeds: they make predictions and give reasons, they observe carefully and talk about what they notice, and they record their observations with realistic drawings, pictures, labels, and words. In a few weeks we will be planting seeds to observe how they grow. We will also explore the conditions that a seed needs in order to grow well. We look forward to learning more about seeds during the exciting field trips that are coming up! We have started to use SeeSaw in our school. Please use your child’s code to access class pictures and updates. Family Conferences will take place on Thursday, November 15th. Please sign up using the link to PTC fast. There is no school on November 6th, November 12th, November 22nd and November 23rd. Next Family Friday will take place on November 21st. More details to come. First graders have been practicing reading quietly and independently for up to 10 minutes every morning! Last week we read with each student individually to assess their reading strengths and create differentiated groups. This week, students will begin to shop for book box books. The boxes have a variety of just-right books (these books don’t feel too easy or too hard, but may have a few tricky words). Each student will fill their own book box with approximately 10 books. Students will also have 2 free choice books. Each week, students will change those books for new ones from the Classroom Library. (More info on that to come). Additionally, each week, we will visit the School Library, where students choose one book to keep in the classroom for the week. We have been reading with partners, discussing books, and making predictions. This month, Class 304 will study the features of fiction (characters, setting, problem, events, and solution). At home, you can ask your child to talk about the books they read, name their favorite part, what they think about the characters, and/or if they liked the book and why. Welcome to first grade! We are so excited to meet all of you very soon. We have been working hard during the last few weeks to get our classroom ready and plan for our first few weeks of school. We are going to have a wonderful year filled with learning and growing as we get to know each other and build our classroom community! Erin this is in her second year of teaching at Peck Slip and working with Alina. She has taught both first and second grade for 13 years. Her summer was a busy one! Erin has a daughter, Riley, who is 6 years old and will be starting first grade too! She also has a baby, Charlotte, who is 17 months old. Erin and her family spent most of the summer at the beach, but they also took a trip to Spain. They love to spend time outdoors. Alina has been a teacher for the past eight years, and four of them spent here at Peck Slip. This will be her fourth year with the first grade team! Alina enjoys travelling and being outdoors. This summer, she tried rock climbing for the first time and had a blast! She also spends time writing music and practicing her favorite instruments. We want to tell you a bit about first grade so that you are as excited for this year as we are! We will begin every day with morning meeting and will have time each day to do math, write, and of course, read! During the fall we will study seeds and get a chance to plant, observe, and write about our seeds as they grow. Our second big study will be a surprise, but trust us, it’s a ton of fun! If you have any questions or concerns, please email us at ENichols2@schools.nyc.gov and AVayner@schools.nyc.gov. We will begin checking our email when we return on September 4th . We hope you enjoy the rest of your summer and we look forward to meeting you on Wednesday, September 5th. May was an exciting month for first graders (and teachers too!). It was a treat to have families eat at Munch for Brunch. The kids worked really hard to plan for the big day and we hope that you enjoyed yourselves as much as we did. On May 2nd, we had the opportunity to visit Vintage 61. The trip was extra special because the kids got to name a drink for the restaurant. The Sparkly Sports Juice Ball was a hit and the kids were sent home with the recipe. If you visit Vintage 61 and request the drink, it’s complimentary. Later that week, we interviewed a pastry chef and we had a cooking lesson with Chef Shiraz. We learned to make mozzarella tomato bites and a pear and goat cheese cracker. Children had additional opportunities to write reviews about different restaurants, research restaurant roles, and apply for jobs. Students brainstormed ideas for restaurant cuisines, names, and menu items. During the latter part of the month, much of our writing time was devoted to making invitations and signs and practicing the different skills that each child needs for their job. We are excited to revisit poetry this month. We will read more poems and write our own poems. Children will identify features of poems and will use those features in their own poems. We will write different types of poems including list poems, shape poems and sensory poems and will experiment with using repetition and white space. During May students studied surveys and data. We learned how to collect data and construct bar graphs. Students worked individually or in partnerships to create a survey question, poll classmates, and represent data. We analyzed data and made conclusions such as how many children voted, which choice had the greatest and fewest votes and how many more or how many fewer children chose one response over another response. This month we will learn about time and money and review important concepts that we learned throughout the year. You can support your child at home by helping them identify different coins and their value and reviewing how to use both an analog and digital clock. First grader goals include identifying the hour and minute hand and telling time on the hour and half hour. During May we read many fiction and non-fiction books about restaurants. During independent reading, many children continued to explore series books. Our reading work this month will focus on building stamina. Students began the year with just 5 minutes of independent reading time per day. They are now reading for 20 minutes and are using bookmarks to ensure that they complete a book before starting a new one. This month we look forward to revisiting how far we’ve come this year. Kids will have opportunities each day to reflect upon what they’ve learned and participate in bonding experiences that help us prepare to say goodbye to each other at the month’s end. We have loved getting to know all of your children and are so proud of the progress they have made. Thank you for your support. We look forward to seeing you at our final Family Thursday! April marked the exciting start of our Restaurant Study Unit! Much of our reading and writing work this month was embedded in our study of restaurants and how they work. This month students began to take a deeper look at the characters in their books. Students worked in character clubs as they read books from different series. Students began by thinking about their own traits. They then named traits that they noticed in their characters and supported their thinking with text evidence. Students noticed patterns in a character’s behavior and used these patterns to predict how characters might act in different situations. Students learned to compare and contrast main and secondary characters and main characters and themselves. In upcoming weeks, students will compare the adventures that characters have in different books within their series. Students will also have the option to continue their character work by choosing a second series to study. In April, we began writing facts and opinions when we launched our Restaurant Study. Students also crafted interview questions and wrote facts about the different restaurant employees who we interviewed. Visitors to our classroom included Colleen Mitchell, restaurant owner (Cucina Benne), Rebecca Newfield, former server, and Dara, the executive chef at Houseman in Tribeca. We learned about the role of a manager and a sushi chef during our first restaurant visit to Suteishi. We were excited to taste avocado rolls and edamame after our visit! This month, we visited Il Brigante and will visit a new restaurant, Vintage 21 that was opened by the Vasseur family (parents of Peck Slippers!). Our upcoming visits will focus on the quality and types of food offered, the layout of the restaurant and the service. Later, students will learn to use their observations to craft their own restaurant reviews. In April we spent our math time measuring different objects. We discovered many important ideas about the different things that mathematicians need to do in order to measure accurately. We began the unit by measuring different lengths with our own feet. We found that even though many kids were measuring carefully, we were all getting different measurements! This activity led us to conclude that we needed a standard unit to measure accurately. We also noticed that inaccurate measurements will result if we leave gaps between units or overlap units. We learned that it’s crucial to start measuring with a unit that is aligned to a zero. We also learned that larger units are helpful when measuring larger distances and smaller units are used to measure smaller distances. We are excited to use our ideas about measurement to construct and use an open number line. During May, we will study surveys and data. We will learn how to collect data and create graphs. We will analyze data to make conclusions. We will notice how many people answered a survey, what were most popular and least popular choices and will learn how to compare data. May 30th– Restaurant Study Celebration (Family Wednesday! ), Sign up sheet for our restaurant reservations coming soon! Thanks to all who have accompanied us on our walking trips. We really appreciate your help! This month, we will visit Il Brigante and a new restaurant, Vintage 21 that was recently opened by the Vasseur family (parents of Peck Slippers!). Our upcoming visits will focus on the quality and types of food offered, the layout of the restaurant and the service. Later, students will learn to use their observations to craft their own restaurant reviews. May 30th- Restaurant Study Celebration (Family Wednesday! ), Sign up sheet for our restaurant reservations coming soon! This month we looked carefully at punctuation and various fonts to help us read fluently and with expression. We learned that big words tell us to read with a big voice and little words tell us to read with small voices. We noticed bold and italicized words in read alouds and in our own books and learned to read these words with strong feelings. In April we will begin our Character Club Unit. During this unit, children will identify main and secondary characters and describe characters based on their traits. Children will compare characters across books and will understand that knowing a character well can help us predict their actions. During March we wrote All About books based on topics that we know well. We used the information that we gathered through interviews, books and the internet to help us add more to our books. We included many different non-fiction features in our books such as a table of contents, diagrams, fun facts, headings, bold words, and a glossary. We are so excited that so many families got to see our books on Family Thursday! Our April writing is based on our content study, which is restaurants. During the first half of April we will interview a restaurant owner, a chef, and a server. We will also begin to visit a variety of restaurants and write persuasive restaurant reviews. We will learn to describe the service, the menu and the décor and will learn to include evidence in our writing that supports our opinions. You can extend this work at home by visiting and talking about different restaurants that you frequent with your family. Ask your kids to describe their favorite dish and the reasons why they would recommend or not recommend a restaurant. Our first neighborhood restaurant walk was a success! We loved checking out the different restaurants in our community and noticing their similarities and differences. We will take numerous field trips during this unit and will email all dates once they have been confirmed. We are excited for families to join us on our trips and welcome many chaperones! During March students took an inventory of classroom materials. We learned to group items into tens and ones in order to count efficiently. We noticed that in a 2-digit number, the first digit represents the number of tens and the second digit represents the ones. We began to mentally add and subtract multiples of ten based on our understanding of place value. For example, we recognized that if we were solving a problem like 37 + 20, we could add 2 tens to the tens place for a sum of 57. In April we will begin our Measurement unit. Children will understand that distance is measured as a series of units and that units used in measuring can vary in size. Students will begin the unit using non-standard units (their own feet) and will grow to understand that standard units are needed to ensure accurate measurements. Colleen visits on Wednesday April 11th for an interview with a restaurant owner. 🙂 Thanks Colleen! First Grade visits Suteishi Sushi Restaurant. Many More Trips Coming up. We will send emails when the dates are finalized. We’ll be sending out many trip forms in the coming months. If you ever lose one, here is BLANK copy. Please try to use the forms we send home rather than the blank because we always fill in specific information about the trip before handing them to families to sign. However, if you do lose a form and need to use a blank copy, please take the time to fill in the following information before handing it in to us. Thank you. Here is the link for the trip form. Much of our February reading work focused on poetry. We studied the different features of poems such as white space, rhyme, rhythm, repetition, and imagery. We read poems from many different anthologies, including our class anthology. We learned that some poems have shape, poets use specific word choices, and that poems can be about many different topics. We noticed that poets write lines and use interesting punctuation. We are excited to revisit poetry when we prepare to write our own poems this spring. This month we will look carefully at the work of Donald Crews during our Author Study unit. We will notice how Crews uses punctuation and varying fonts in his books as we continue to work on fluency and expression. You can support your child with this work at home by pointing out interesting punctuation in their books and taking turns reading character parts. In April, we will begin reading series books in Character Clubs. February marked the end of our How-to writing unit. We began the unit by looking at different types of how-to books and noticing their features. We brainstormed a list of topics that we know well and could teach others about. We learned to grab our readers attention by starting our piece with a question or a reason that would motivate our reader to read our books. We planned steps across our fingers and acted out our steps to ensure that we included important details. Next, we drew teaching pictures and labels. We added transition words to show the sequence of our steps and wrapped our pieces by finding a way to let our reader know that they were ready to try out our directions. We celebrated by sharing our books with partners and offering compliments as well as helpful suggestions for future how-to books. Children will continue working on informational writing by writing their own All About Books this month. Students will begin the unit by revisiting non-fiction books and noticing their features. We will choose topics that we know a lot about and will learn to create a table of contents, fun facts, diagrams, glossaries, and various other sections in our books. During the latter part of this unit, we will use books to research interest topics and write a second All About book based on our research. In April, we will switch genres and learn how to write persuasive pieces. Students delved into geometry this month as we worked with Van Hiele puzzles. Children used a set of shapes to compose, draw and identify new shapes. 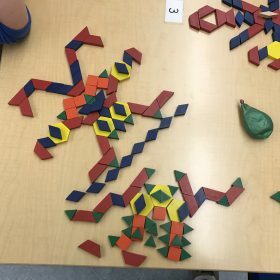 Children learned to name and describe shapes by examining their characteristics such as the number of sides, number of vertices, and number of angles. This month marks the beginning of our Organizing and Collecting Unit. This unit is designed to help students develop a deep understanding of place value in our number system. Throughout the unit, students will count assorted objects and will learn to group those objects into groups of ten and individual ones. Children will learn that place determines value (ie: in the number 56, the 5 represents 5 tens or 50 and the 6 represents 6 ones, or 6.) This understanding will help children as they begin to use more sophisticated strategies, such as splitting apart numbers, to add and subtract and solve problems mentally. In February we studied, rehearsed and performed plays during Readers Theater. Children practiced reading fluently and with expression by thinking about how their character was feeling and what their character might sound like. Children worked on projecting their voices and using their bodies as they acted out their parts. March is an exciting month because we will begin Restaurant Study. During this unit children will learn how restaurants work. We will visit several different types of restaurants and write persuasive reviews about the businesses we visit. We will interview different restaurant workers to learn more about their roles and responsibilities. After that, we will create our own restaurant! School Business: Please take some time to complete NYC School Surveys. Take the 2018 NYC School Survey online. Thank you to all who joined us on our 100th Day Celebration. We had a blast and look forward to seeing you on our next Family Friday! Children have been really digging into their books and thinking carefully about the way they read and engage with text. This month in reading we zoomed in on decoding, comprehension, and self-monitoring strategies. Decoding strategies target word-reading. Some important points about decoding include: looking at the beginning, middle, and end of a word, looking for a taught spelling pattern or a little word (ex: if you can read –ake, you can read it in make, rake, shake, and mistake). If you can’t decode the word, then you might skip the word and read to the end of the sentence and then think about what would make sense. Comprehension strategies involve stopping to think about text: when we stopping to think, readers make sense of what they already know about the book, make predictions about what might happen next, and go back and reread if they are unclear about what happened so far. As we read, readers can stop and revise their predictions based on new information in the book. Children can also make connections to their lives as well as to other books they have read. Finally, readers can wonder about books by posing questions as they read. These strategies help students move beyond the text and into the realm of inferring. Self-monitoring involves using metacognitive processes while reading to notice when something does not make sense and to choose an appropriate strategy for self-correction. Self-monitoring involves both decoding and comprehension. Next, we are moving onto our Poetry unit. We’ll study elements of poetry including rhyme, meter, word choice, imagery, white space, etc. Later in the school year, students will use what they learned to write their own poems. We are coming to the end of our How-To Unit. First graders thought about topics they knew well and could teach another person. We talked about the features of nonfiction texts that we had read aloud in class. Then everyone implemented these tools to create dynamic How-To books. Children made sure to include an introduction, a list of necessary materials, sequential steps, and an ending. Writers used words such as first, next, then, after that, and finally to indicate transitions between steps. We talked about how important it is to add details and be specific so that your reader will know exactly what to do. Next in writing, we will shift focus to writing All-About books. Rather than teaching someone how to do or make something, these books teach information about a particular topics. Nonfiction features such as diagrams, pictures with labels, fun facts, glossaries, table of contents, and sections help organize and clarify information for readers. Students will use these features to carefully present information about a topic they know well. Then kids will use nonfiction text to research a topic of interest and write a second All-About book on that topics. This kind of problem-solving sets up a foundation that leads into 2nd grade math where kids are working with multiple digits. Here is what kids might work on in second grade math. If 8+8=16, then 58+8 = 66. If you can break apart a number you can solve more quickly using mental math. Our current unit of content study is Reader’s Theatre. Readers Theatre is a fluency building unit. Children will take notice of the major differences between reading a book aloud, and acting out a story on a stage. Some important aspects of theatre include: actors, scenery, props, and a script. The script gives the actors direction: when to speak, who is speaking, and how to say the lines. This unit encourages readers to develop phrasing which involves reading words in chunks of 3 or 4 rather than word by word. Thinking about the character’s feelings helps children develop expression in their reading, which means altering one’s voice by attending to punctuation and in order to sound like the character or the storyteller. Family Friday is coming up. Be on the lookout for updates. The topic will be the 100th day of school. Winter Break is February 16-23. We hope you have a lovely break! The New York City Rescue Mission is collecting donations for hygiene kits. Children decorated brown bags for the kits with heartwarming pictures. Please be sure to check the flyer that was sent home today for what you can donate.